Your essential Canon EOS 7D Mark II camera field guide in a convenient pocketable style. This EOS Pocketbook for the 7D Mark II is a concise guide to your camera and small enough to carry with you everywhere. Nina Bailey, Technical Editor of EOS magazine and author of the popular EOS eBook series, has the solution. 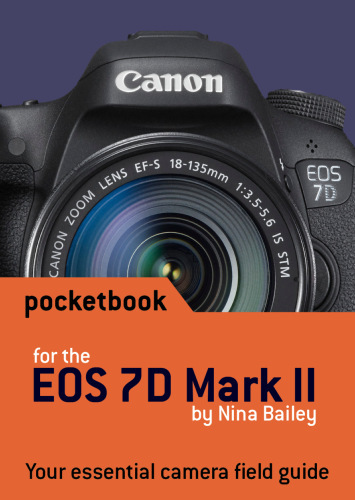 This new Pocketbook for the Canon EOS 7D Mark II is a concise guide to the most used and confused features and controls on your camera, based on Nina’s vast experience as lecturer at EOS Training Academy – hearing first-hand what photographers want to know and understand about how their EOS 7D Mark II camera operates. These pocket books are a god send when your out and about, I have 6 now for differing cameras and tasks. A good reminder of what I had learnt from my day’s training. I can hear Nina talking as I read it. Slim enough to carry with the camera for that memory jog. I bought another for my daughter and her 70D but that came from Amazon postage free!! The 7D Mk II one was out of stock on there. Print is a bit small. As of to day 12th Oct I have not received my 7DII pocket book. Excellent books clear, concise , easy read, convenient size for slipping in your pocket. An overpriced rip off waste of money. Do not waste your money. I am sorry to hear that you were disappointed with the pocket guide. Please return it to us for a refund. Great size for carrying on shoots. Love thee protective cover provided with it. Good, concise information. I definitely recommend this for 7D Mark ll users.